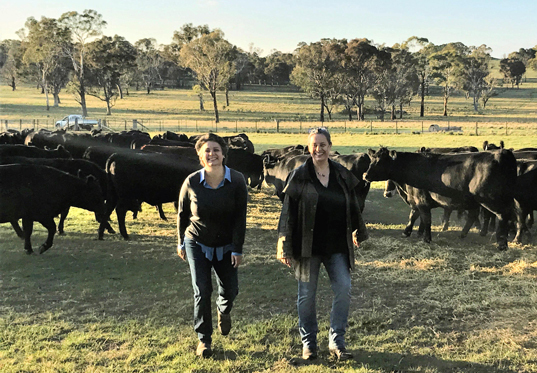 Anita Taylor and Sarah Burrows, who both grew up in regional NSW, are developing an on-farm abattoir focused on the supply of ethically-processed and sustainable meat. “We are offering a completely new meat processing platform which will be modular, lightweight, mobile and able to process multi-species including cattle, sheep, goats, pigs, deer, and kangaroos,” Ms Taylor said. Their startup company, Red 8 Produce, has been developed with the support of Jobs for NSW Local Innovation Network member, the UNE SMART Region Incubator (SRI). “We are a founding member of the SRI and worked out of there until we grew to a point where we could move to our new base at Uralla,” Ms Taylor said. “But we are still very much involved with the SRI and the support it provides such as networking, access to an expert in residence, mentoring, and functions with fantastic speakers like Virgin Startup Program founder Ian Mason and TechLadies founder Elisha Tan. Ms Burrows said the UNE SMART Region Incubator not only provides shared resources but also a collaborative and safe place to discuss the challenges of establishing a new business. “It allows you to get other perspectives and fresh ideas and to share learnings, and it can be incredibly helpful in getting a leg up with your business,” Ms Burrows said. “Another main benefit for startups is it can provide a place to work rather than having to work off the kitchen table, which can be tricky for people juggling work with families. across the state,” Ms Cook said. Red 8 Produce continues to tap into the LIN as it chases its vision to build a business that can provide a good return to farmers while looking after animals. “Red 8 Produce meat will be of exceptional quality and flavour and we will partner with like-minded suppliers and butchers so that consumers will know their meat was produced with the highest quality of care right across the entire supply chain,” Ms Taylor said. “We want to make farmers more sustainable, keep local communities alive with work, and also provide consumers with high quality, ethical and sustainable meat. “We’re not going into competition with the big blokes and trying to replace abattoirs but our product will cater to a niche market that is looking for particular attributes in their meat including provenance, traceability, and a lack of additives.